What’s the next best thing to being wrapped in a blanket? The teddy bear coat. Ever since I saw this trend via Instagram on some of my favorite bloggers– I was on the hunt for a similar jacket. The fleecy fabric is so soft, adds a cool texture and will be sure to keep you warm through these winter months! Luckily, American Eagle Outfitters mixed two of my favorite trends together — the moto jacket and the teddy bear coat. The best of both worlds! I went with a size small and it fits a bit oversized which I love. I decided to keep the rest of my look super simple, all black, and kept the jacket as my statement piece. I’ve been loving slip dresses since last summer and wanted a way to wear the style into winter. I paired my Don’t Ask Why black slip dress over a pair of slashed-knee American Eagle jeggings for some edge. To complete my look, I added one of my favorite beanies, also by AE, with the cutest faux fur pom and my Steve Madden pointy boots. This is the perfect look to take from day to night. Just when I thought I could put my parka away for good (rejoice!) it’s somehow freezing again in the big city. Before we go full-on spring closet flip — let’s keep it real. 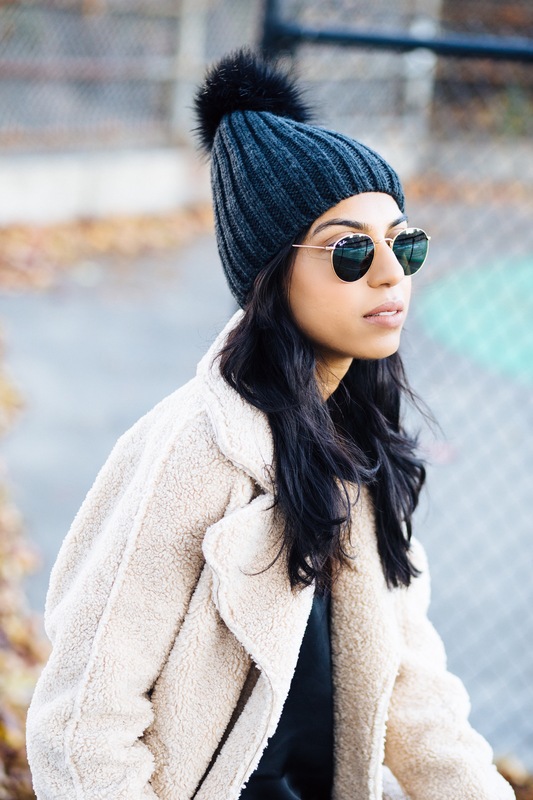 We might as well get some CPW (cost per wear) out of our favorite winter sweaters, right? I love an oversized sweater with a leather legging. This look is by Aritzia. I love the oatmeal shade of this sweater. It’s super cozy and insanely warm. I’m always into a good texture mix so I brought back my go-to leather leggings to keep it cool and sleek. I styled this bandana like a choker. It gives a little bit of edge to any look. Back by popular demand (my sister), I’ve decided to do an updated post on how to wear my favorite winter accessory — the blanket scarf! Many of my friends know that I’m a bit addicted to this large accessory from Aritzia. In these colder months, it saves me walking around this chilly city! If you don’t own one yet, I highly suggest buying one for yourself, your mom, your sister and your girlfriend too! There are many ways to wear it — so prepare to be amazed! Also, how fun is this gif? Let’s begin — I like to first fold it diagonally so it’s a bit easier to work with. The Shawl – When it’s not too cold, this is a perfect way to drape the scarf to add some texture and color to your look. A great sub when you don’t feel like wearing a coat. Especially on a day like today where it was randomly 50 degrees in NYC! 2. Swaddle Me – I’m a new Aunt to my baby nephew Ali — let’s just say babies aren’t the only ones who can get their swaddle on. (Lol) Sure you might not be able to move your arms but you’re going to be super comfy and warm all day long! 3. The Classic – Fashion meets function. Your safest bet to stay warm all winter long. Your scarf tied with an easy loop around your neck won’t go anywhere. Sometimes I completely cover my mouth and throw on my parka with a hood. Your friends might say, “Are you climbing Mt. Everest” (true story) but who cares — anything for warmth! 4. Flip It and Reverse It – Take a cue from Missy (she’s back!) and wear the reverse side of your blanket scarf the next time you drape it like a shawl. I’ve been loving winter whites and creams this season to brighten my everyday look in a sea of black parkas. Add my favorite camel coat and I’m ready for a very fashionable February! All I need is coffee..mascara…an oversized grey cardigan…ripped jeans and maybe a slice of pizza. I felt out of the loop — coffee time was a sacred moment at the office where coworkers could share fun stories and recap their weekend — if I didn’t partake I might not be part of the conversation – the horror! Then one summer, an intern we had enlightened me. “Syma, why don’t you add some hot chocolate to your cup of coffee, then you’ll have an instant mocha!” Pure genius. Four years later, I still drink coffee with hot chocolate mix — I apologize to my dentist but for now this is the only way it can happen. So now what do I need in the AM besides coffee and my solid 15 minute morning routine? Mascara. This tee from Aerie couldn’t be cuter or more Insta-worthy if I do say so myself (Jay Z voice). Sadly, it’s freezing out so I couldn’t show you the beautiful low-back but I love the soft jersey this tee is made in. I paired this tee for a casual coffee run with my American Eagle Outfitters Tomgirl jeans and oversized cardi. In the Tomgirls I size down 2 sizes — I’ve never loved a super slouchy jean on myself so these still feel like I won’t lose my shape but give that effortless look I always love. A simple grey cardigan, also from American Eagle Outfitters is all you’ll want to wear this winter. I completed my #OOTD with my go-to Rachel Comey booties and I’m off to grab a cup of joe and run my usual weekend errands with a side of window-shopping. Photos shot at Beansmith Coffee by O.